A Sense of Place · Spoons galore! Project 1: A cherrywood butter knife. One of MERL’s latest acquisitions is a beech spoon carved by spoon-carver Martin Damen during an oral history interview conducted for the Reading Connections project. Martin is a regular at the MERL village fete (he’ll be here again this year on Saturday 31 May) and the MERL traditional crafts fair, and is also a strong supporter of the Heritage Crafts Association. Ever since I first met Martin and saw his beautiful spoons I’ve wanted to have a go, and this weekend I finally had the chance when I went on a two-day course with him. I love trying out different crafts I encounter – because it makes cataloguing easier when you understand how things are used, because I just love having a go at different things, and because I’m hoping to discover the craft that really suits me. 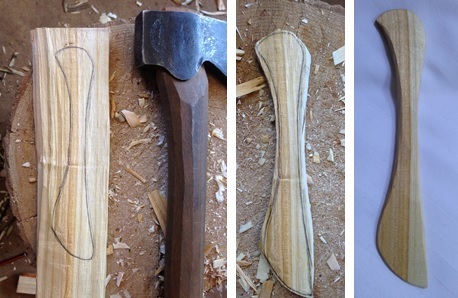 Project 2: Making a spoon, part 1. The course was brilliant – Martin is a great teacher and explained everything really clearly (and you even got a knife and a course book with instructions and diagrams to take away with you). We began by looking at the two key tools – a knife and an axe – and practising the different techniques for using them. 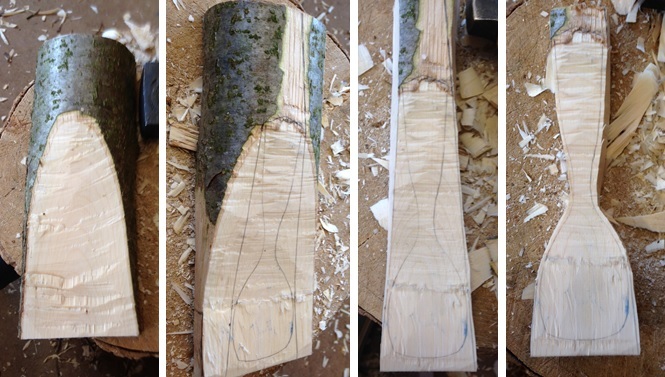 Martin makes it look so easy but you do need significant amounts of force/power – hardly surprising given that, even though you are using very green wood, you are using wood. The first day was spent making a butter knife in cherrywood. On the second day we were introduced to another tool – the hook knife, which is used for hollowing the bowl of the spoon – and made our very own spoons out of hazel (I think). Martin was really good at encouraging us to think about how a spoon functions and to consider the shape and form needed to make a spoon comfortable and practical to use (e.g. the shape and depth of the bowl, the thickness of the rim, the crank of the handle etc). 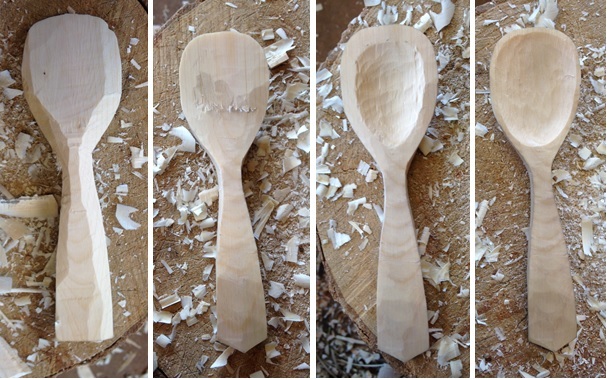 Project 2: Making a spoon, part 2. It’s not quite finished – I still need to take the edges off. It was really really hard work and I felt like I was struggling the whole time – definitely not something that came naturally to me (although obviously a lot of it is down to practise and familiarity with using knives and wielding axes). I’m really glad that I had a go and am very pleased with my pieces (which did admittedly receive quite a lot of help from Martin – I was very slow and would never have completed them otherwise). We got to take some wood away so I am hoping to try again in my spare time – although I think I’ll stick to butter knives for the time being!